This Callaway Tour iZ is my favorite of Callaway's golf balls. Overall, it's really between this ball and Titleist's Pro V1X. The ball is Callaway's premier ball that their tour players use. This ball is the firmer, longer kissing cousin to the Callaway iS ball that has more spin and a softer feel. Let's take a look inside... "Scalpel please, nurse." After peeling back the soft urethane cover (the gold standard in every brand's premier golf ball), we find three more layers. The next layer is a surlyn boundary layer that covers two distinct cores. You golf nerds might remember the term “surlyn” because many of your “lower end balls” have a surlyn cover. This is much harder cover with gives the iZ the firmer feel and added distance. In addition, this dampens some of the spin, so the ball doesn't grab as much on the greens. But the upside is, with less spin you have more carry in the air off of the driver. Not only that, this equates less slicing and hooking when not hit pure. Pealing back the surlyn cover (suction please) we find our first of the two cores. The dual cores help make the ball playable by a wide range of golfers. You will find the dual cores in both the iZ and the iS balls. These cores are easily compressed by different swing speeds and offer more distance for everybody, not just the tour pro. This is a very good ball that I like almost as much as Titleist’s Pro V1X. The iZ is to the iS, as the Pro V1X is to the ProV1. Sorry, is this starting to remind you of your SATs? In other words, the Pro V1X and the iZ have less spin and more distance, whereas the Pro V1 and iS have more spin and a better feel around the greens. However, both of the firmer balls still have the soft urethane cover and thus have an ample amount of spin and soft feel around the green. Whether you’re a Titleist guy or a Callaway guy, I would recommend keeping both options in your bag. On windy days go with the less spin, on calm days go with more spin. Or when you are “puring it” pull out the spin balls and when you are “hacking it” pull out the low spin balls. All and all, I recommend this iZ ball to you golfers looking for the highest performance ball with more emphasis on distance then on spin. 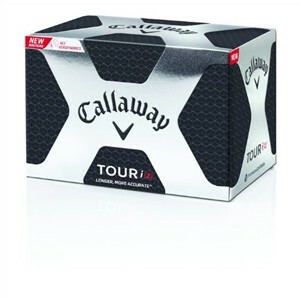 If you are looking for extreme spin, then go with the Callaway Tour iS, and for a less expensive option, take a look at the Callaway HX Bite. This is a tour-quality ball with a harder ionomer cover.